Premier League opening day: How did new boys fare? After the euphoria of promotion comes the hard reality that the job is only half done. The bus parades and end-of-season-parties have become a distant memory for the Premier League newcomers, who started their campaigns for top-flight survival on Saturday. Since the introduction of the Premier League in 1992, there have been 65 promotions, with 29 teams relegated in their first season. 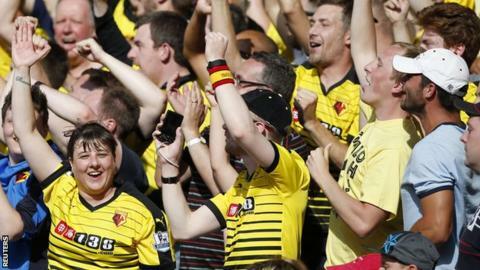 So how did Championship title winners Bournemouth, runners-up Watford and play-off victors Norwich City fare on the opening weekend? Regardless of the result, this was a day that will last long in the memory of Bournemouth fans. Just seven years after they almost went out of business, the Cherries hosted Tim Sherwood's Aston Villa as a fully fledged Premier League side. And they matched their well established top-flight opponents for much of an even game in front of a boisterous crowd at Vitality Stadium. But Eddie Howe's men were taught about the fine margins of the elite level, when Rudy Gestede headed in a late winner for the visitors. "I thought we were outstanding in the first half and very pleased with the display," Howe said. "I think we have learned today what the Premier League is about - how difficult it is going to be if you are not clinical. "There were plenty of positives from my perspective, but also a lot to work on." Former QPR midfielder Joey Barton told BBC Radio 5 live: "If I'm Bournemouth manager Eddie Howe, I'd be a bit worried with what I've got in the dressing room. "I might just dip back into the transfer market." Listen: Joey Barton - "The best player is in the stands. Me!" First-day rating: Seven out of 10 - Plenty of running and effort from Bournemouth, who had three good chances, but they will need to find a cutting edge. Watford have 22 different nationalities in their squad, made 10 summer signings and are on their fifth manager in 12 months. It sounds like a recipe for disaster, but there was no shortage of cohesion for the Hornets as they came tantalisingly close to toppling Roberto Martinez's Everton. Miguel Layun's half-volley put Watford in front before Ross Barkley levelled with a stunner. Odion Ighalo thought he had won it for the visitors, only for Arouna Kone to equalise with four minutes remaining. "Having conceded the second goal so late in the game, the first feeling when you go to the dressing room is that you have lost two points," Watford boss Quique Sanchez Flores said. "But we have played against an amazing team. Everton were playing well - they had had to change their way of playing. "If we are honest, we have to recognise that this result is OK. Of course, we can improve. But for this first match, I am happy with the performance." Former England striker Alan Shearer told BBC Match of the Day: "Watford were not involved in a goalless draw at all last season and, judging by their performance against Everton, it will be a while before they are involved in another one." First-day rating: Eight out of 10 - Watford looked the most confident of the promoted sides, and scored the goals to back it up. This felt like a close shave for Everton rather than two points dropped for the Hornets. When is a high foot too high? Ask Cameron Jerome. The Norwich City striker thought he had grabbed an equaliser, and with it an opening-day point, when he hooked the ball into the net with his side 2-1 down against Crystal Palace. But referee Simon Hooper said the former Stoke forward's boot was dangerously high to Joel Ward's head and ruled out the effort. It cost the Canaries, who went on to concede an injury-time third from Yohan Cabaye as Carrow Road was served up a disappointing return to the top flight. "If the lad was going to be potentially hurt by Cameron's leg, then I think it might have been a foul, but I don't think that was the case," Norwich manager Alex Neil said. "His studs are no way any danger of hitting the lad, so as far as I am concerned it was a perfectly good goal disallowed. "I am not going to sit here and criticise the referee, because they have difficult jobs, but when it affects the game and you potentially getting a point or three points, then it is frustrating." Former Norwich striker Chris Sutton told Final Score: "The disallowed goal is the worst decision you will see all season - on the opening day. "If Palace had scored it, I would have been saying the same. It was a wonderful finish. It's ridiculous. All he did was hook it over his shoulder." First-day rating: Six out of 10 - Norwich had most of the possession, particularly in the first half, and had plenty of shots at goal, but ultimately learned that they will need more conviction if they are to survive.